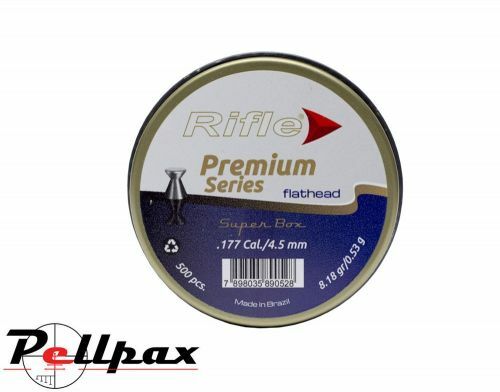 Rifles Premium Series are amongst the highest regarded pellets in the business and are incredibly well made from high grade lead and provide exceptional performance in both accuracy and power. Ideal for target shooting, these pellets have a wadcutter shape that provides great control over shot placement and cuts clean holes in paper targets for easy scoring. Sold in tins of 500. The top of the line competition pellets, Rifles Premium Series has won World Cups and Olympic medals and are regarded some of the finest currently available. Please wait. This video may take a little while to load depending on the speed of your internet connection.